Yes order was received very quickly and I am happy with the cables. I look forward to your daily 'price crash' - a great idea - and will definitely buy from you again when I need something. 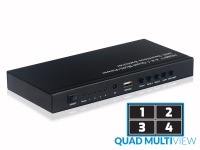 High-End 4-Port HDMI Quad Multi-Viewer with Seamless Switching (1080p 4x1 HDMI Switch) + FREE SHIPPING! View up to four inputs on one display with three multi-view modes and seamless switching! Switches between up to four HDMI sources and sends all of them to a single HDMI output at once. Three multi-view modes allow multiple inputs to be viewed simultaneously. Supports up to 1080p/60Hz input and LPCM/AC3/DTS digital audio. Seamless switching is available for inputs on the same resolution. Multi-input viewing isn't just useful for security stations watching closed circuit cameras! This 4-input seamless switcher makes it easy to keep a track of several input devices from a single TV or monitor with three user-selectable viewing mode configurations available. Keep a track of cameras, blu-ray playback, twitch streams and weather updates all from the one convenient location. And, if all the inputs share the same resolution, you can instantly swap between them or change the multi-view layout without any downtime or long blanking intervals in between. As a powered switch, this unit helps keep your HDMI signals strong by boosting the output, making it possible to run up to 20 metres of quality HDMI cable on either side of the switcher. As an added bonus, there's SPDIF digital optical, digital coaxial and analog stereo outputs for connecting to a separate sound system or headphones. Note: This is not a video wall product. It does not split a single inpout across multiple TVs, but combines multiple inputs onto a single screen. I just wanted to THANK YOU for your EXCELLENT SERVICE. It was fantastic. I will definitely use you again in future and recommend you to my friends!